In pastoral visit in Lebanon, the Chaldean Patriarch of Baghdad denounces the discrimination to which Christians are subdued and vindicates the contribution that they have made together with the Muslims for the history, culture, human rights in the Middle East. Without Christians there is no Arab modernity. An appeal for the abducted Orthodox bishops and a thank you to Lebanon, model of coexistence. Baabda (AsiaNews) - the Eastern Christians of different denominations should be united if they do not want to suffer a "slow death". They are part of the historical and cultural fabric of the Middle East and have worked and suffered with their Muslim brothers for a "common dignity and coexistence". Their recognition as full-fledged citizens is the way to a modern Arabic world. These are some of the themes that the Chaldean Patriarch of Baghdad, Mar Louis Sako has treated in the Homily of the mass celebrated yesterday in the Cathedral of St. Raffaele at Baabda. The Patriarch, in pastoral visit to Lebanon's Chaldean community, greeted the Apostolic Nuncio, Mons. Gabriele Caccia, expressing to them his esteem for all that Pope Francis is doing for peace in the Middle East. The mass was attended by the Lebanese President, Michel Sleiman, as well as Christian members, Sunnis and Shiites in Parliament, along with many ambassadors. Referring to the Apostolic Exhortation "Ecclesia in the Middle East" of Benedict XVI, Sako has asked all Christians to "remain firm" in their roots by educating their children in the faith received and strengthening the ecumenical work of unity among Christian denominations: without unity, he stressed, "we have no future." "This unity", he continued, "maintains our presence and continuity, our rights and our role ... There is no future for us if we remain small, regional churches closed in themselves. Reform is a must. Reform is a matter of life or slow death!". 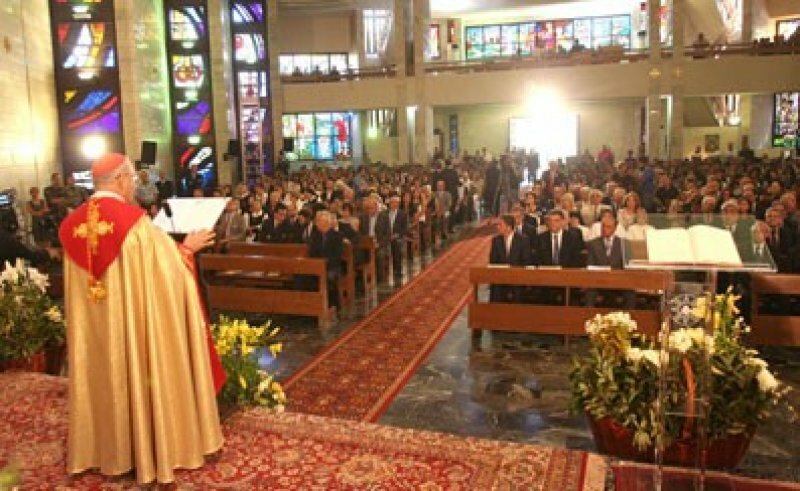 Among the challenges the Christian world of the Middle East must face, he listed some "discriminations": the freedom to convert one way [only from other religions to Islam]; the laws on personal status; "the opacity on Christian history, making the average Muslims believe that Christians are foreigners, creating a sense of alienation in the young Christian generations that leads them to emigrate." But above all he highlighted "the religious extremist movements and the call by some of them to humiliate non-Muslims, making a public demand not to participate in their joys and sorrows." This, added the Patriarch, "leaves us worried and horrified". "We Christians", he explained, "are an essential and integral part of the fabric of the Orient, its culture and history; our roots are deep and they stretch to 2000 years and cannot be torn uprooted. We keep the homeland in our hearts and many of us have sacrificed their lives alongside their Muslim brothers, to consolidate the warmth of freedom, sovereignty, dignity and coexistence. We want to live in our countries, in our country, without discrimination between majority and minority. We do not want to emigrate; we want to live in dignity as citizens enjoying our rights and exercising our duties". "There is no Arab solution", he said, "except by adopting [the right to] 'One Citizenship', given that Arab countries are a mixture of peoples, nationalities, cultures, languages, religions, ideologies". The Patriarch then talked about the regional situation and, in particular, "what is happening in Syria ... We wish for the fighting to stop, and for Syria and the region not to slip deeper into chaos and violence." "We ask everyone," he added, "to use rationality, dialogue and understanding in order to achieve the necessary reforms and an inclusive political process. Fighting does not solve the problem, but deepens and brings death and destruction".